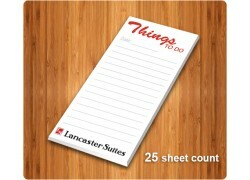 Notepads Direct Helps to Make Lasting Impressions through Custom Notepads! 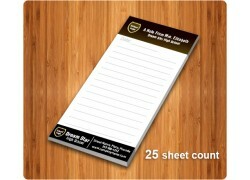 Custom Notepads makes everyone to take note of you. Creating brand/personal awareness and staying organized at the same time may not be an easy task and we help our clients to achieve both at the same time with custom printed notepads! 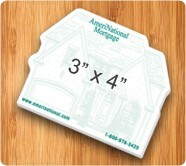 These personalized notepads adds glamour to campaign with their high worthiness. 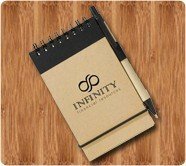 All imprinted promotional notepads embodies certain personality, expression, reputation and business spirit, so we offer them in variety of styles, page sizes and shapes to meet these traits. Free design, free art set up, innovative printing options and free online design proof in 24 hours are some benefits of sourcing your custom notepads with logo from us. Customized notepads lend great brand building opportunities to all marketers who are struggling hard to make their mark. 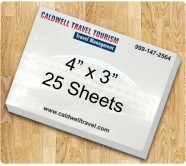 Marketers can get their brand logo, other information printed on every sheet for attention building. Notepads are extremely useful for everyone. 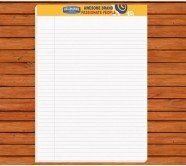 From homemakers scribbling their grocery lists to students jotting their notes to business executives taking down office notes, there is actually no limit for the utilization of these notepads. By giving away-customized notepads, you can ensure that your logo is just a doodle, scribble or jot away from recognition! 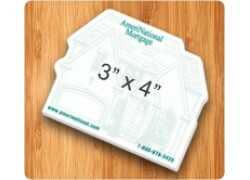 Promotional notepads are usually stored in the living room or office drawers, beside a desktop or telephone or they are regularly carried within bags or backpacks. 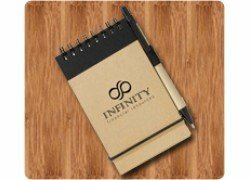 These notepads can easily catch those laundry lists, phone messages, reminders, light-bulb moments and random thoughts that may strike anytime, anywhere. (SUGGESTION Making a laundry list, writing down phone messages, reminders or if you having those light-bulb moments are the perfect time to grab and make use of the notepad.) 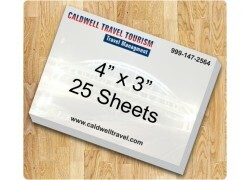 This means you can create impact with sheet after sheet while remaining within arm’s reach. Personalized note pads, custom sticky notepads, custom scratch and notepads, custom printed legal pads and custom sticky memo cubes are popular since people use them regularly at offices and homes. These paper notepads allow you to deliver a strong brand message and build lasting impressions to prospects and clients during trade shows or business conventions. 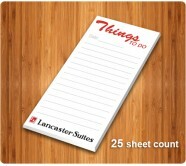 In summary, custom notepads help people to keep their tasks prioritized and organized. Be it a family friend or a client, you can serenade them by handing out these notepads. 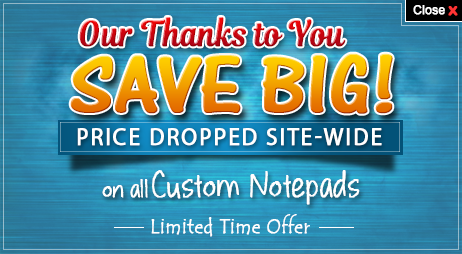 We’ve put one of the most comprehensive selections of personal and business oriented made in USA notepads. 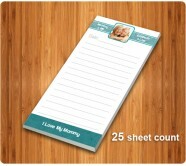 These custom personalized notepads are organized under different categories and shop by design. 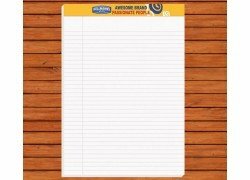 Be it logo imprinted custom notepads for brand building, emotional personalized notepads or a joyous stick figure notepad, one can avail them at the best price. Know more about it, call us at 855-8668372 or send us a message at .